The occasion called for celebration. It is not every day that someone on Watani’s staff marks the close of 70 years in his life, 50 of them spent on the paper’s editorial staff and 30 on running Watani’s programme al-Mahatta for supporting sick and needy persons through readers’ donations. That someone: Victor Salama. Planning for the big event started out as a ‘secret’, but who can really manage to keep a secret in a place where some 100 journalists—persons whose job is to look out ‘secrets’ and find all about them—work? So it ended up an open secret, and Ustaz Victor as he is called in Watani, Ustaz being a title that denotes someone with extensive knowledge and expertise in a specific field, got to know about the celebration a couple of days before it took place. The celebration was held at St Mark’s hall in Shubra, Cairo, in a climate where love and cheerfulness reigned supreme. 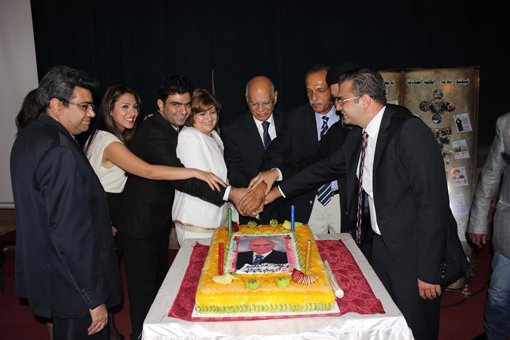 Watani’s staff members, headed by Editor-in-Chief Youssef Sidhom, gathered there. They were joined by Ustaz Victor, his charming wife Laura Hakim who has also been his avid helper on al-Mahatta and is Managing Editor of Watani Francophone, his elder son George who is an IT specialist and resides in Dubai, and his son Michael who joined Watani once he graduated from university with a degree in Media and Mass Communications and is assiduously following in his father’s footsteps. On George’s side was his wife Marianne and their two little children Charles and Chantal, and on Michael’s side was his wife Madonna. Given that Ustaz Victor has spent a significant part of his professional life in Watani reporting on Church affairs, a number of clerical figures were there for the happy occasion. Pope Tawadros II himself was in the United States on a pastoral visit, so he delegated Anba Makary, Bishop of South Shubra, to represent him. Also attending were Father Bishoi Helmy of the Egypt Council of Churches (ECC), Archimandrite Boulos from the Coptic Catholic Church, Rev. Rifaat Fikry from the Evangelical Church, and a number of clergy and Church figures. The evening started with Anba Makary saying Thanksgiving Prayer then proceeded with his word on behalf of Pope Tawadros. Anba Makary’s word centred on ‘giving’, a virtue which, he said, “can only be practised with love … the Bible is full of teachings to that effect.” He cited many of these teachings, and went on to say that Pope Tawadros fully appreciated Watani as a paper dedicated to serving Egypt in its entirety and the Coptic community in specific, and Victor Salama as a Watani figure whose giving involved both the paper and those in need. For Rasmy Abdel-Malek, former deputy to the dean of the Clerical College, Ustaz Victor at 70 is a man with young blood in his veins. Life is not measured in years, Dr Abdel-Malek said, but in the capacity to give. Victor Salama, he said, began work with Watani as a journalist under the great Antoun Sidhom who had founded the paper in 1958, and continued with Youssef Sidhom since 1995. A short video was shown in which a number of figures who had for one reason or the other been unable to attend congratulated Ustaz Victor. Prominent among them were Anba Moussa, Bishop of Youth; Anba Yu’annis, Bishop of Assiut; and Fouad Yassa, General Manager of Watani. Cardinal Antonius Naguib of the Coptic Catholic Church and Anba Appollo called on the phone. Three of the physicians and surgeons who regularly deal with Watani’s al-Mahatta programme testified to Ustaz Victor’s work with the sick. This work involves receiving the patients, studying and verifying their health and social data, contacting the doctors and hospitals that can treat their illnesses, escorting the patients to them, following up personally on the surgery or treatment until the patient is, in most cases, fully cured. He writes their stories in Watani for the readers to know how their generous donations are used, or to ask for more donations in cases where treatment or surgery require sums far above those available to al-Mahatta. Doctors Michel Yassa of the Good Shepherd Hospital, Talaat Helmy of Mar-Morqos Hospital, and Consultant Yusri Wahba were unanimous in their testimony to Ustaz Victor’s love for his work and patients, demonstrated so clearly in his profound dedication to helping them. They testified to his good tempered nature and his being an absolute stickler for detail. “Nothing, not even the slightest detail, escapes him,” Dr Helmy said. Present were three of the patients of al-Mahatta who had gained wide public sympathy. There was Manno, Emmanuel Ghali, who when a 20-year-old student at the American University in Cairo in 2003 was hit by a car and suffered severe internal and external injuries that left him between life and death. Watani readers were given the facts about Manno’s condition, and that his only hope was to be flown to Germany for treatment. Through the readers’ generosity Manno made it to Germany where he underwent specialised treatment. With a larger-than-life smile and excited cheerfulness Manno was wheeled into St Mark’s hall to take part in the celebration of Ustaz Victor. He told the audience how much the overflowing love of Victor and Laura Salama had supported him and his parents in their darkest moments, and talked of his journey to Germany. “At the time,” he said, “I was unable to talk. Now here I am talking to you and reminiscing about those difficult times. God has been so generous to me through Watani’s readers and through the love and support of Victor and Laura.” Manno concluded his short speech, but there were many tear-streamed faces in the hall. Amm Zakariya came especially from his village of al-Badari in Assiut, Upper Egypt, to participate in honouring Ustaz Victor. In his legendary humour and poetic language he recalled how he had come sick and penniless from Upper Egypt, and how he was embraced with love at Watani and given all the medical care he needed at the hands of the doctors who work with al-Mahatta. For a veteran Watani staff member like Maged Attiya—Attiya was editor-in-chief of the paper during the turbulent 1980s and is currently a Watani columnist—Ustaz Victor is the epitome of reliability and dependability, a rock in hard times. Mr Samy Ermiya, head of the YMCA of Egypt gave Ustaz Victor the YMCA silver medal in appreciation for his contribution on the media and social service levels. Victor Salama has been an active member of the YMCA Egypt for decades, and is now on the board of the association. Michael Victor Salama did not speak much about his father; his love and appreciation were evident in the effort he had made to organise the grand event and invite every one of his father’s friends. Finally, it was the turn of the Sidhoms to give a word about Ustaz Victor. Samia Sidhom said that so much had already been said about him that she was at a loss to add much, but it was worth noting that Victor Salama’s distinctive writing style never failed to inspire her. “It’s a very special style,” she said, “because even when handling topics that may be dry or official, he never fails to add special warmth and depth to it. This, for me, means one thing: he writes with all his being, all his heart.” As to his work with the sick, Ustaz Victor never made a secret of its being the source of every blessing in his life. As to the professional prowess of Ustaz Victor, Mr Sidhom said, it is extensive and is crowned with a very special writing style “which I can immediately recognise.” Even when he has to revise or edit material written by others, his style is so distinctive, it takes over the entire work. “This is why,” Mr Sidhom laughed, “we no longer assign him that role. Michael asked me to talk about the ‘Problems on hold’ where Victor Salama is concerned, and this is the one I could cite.” ‘Problems on hold’ is the title under which Mr Sidhom writes the vast majority of his editorials. Ustaz Victor rose to the podium. He profusely thanked all who participated in celebrating him with such overflowing love. “The only word in my vocabulary that can express what I now feel is ‘thank you’,” he said. He acknowledged his father and mother’s influence and support of his career as a journalist, and his only sister and her husband who welcomed him in their Cairo home when he left Alexandria to pursue his career in the capital. He thanked Laura, his wife for 35 years, for being the light of his life and the “woman whose price is far above rubies” as the Bible says. He thanked his son George for taking precious time off his demanding job in Dubai and coming to Cairo with his family to share in his father’s 70th birthday. He thanked his son Michael and Madonna his wife for the effort that went into making this evening such a great occasion. Ustaz Victor offered warm thanks and appreciation to his “mentor and spiritual father” Antoun Sidhom, and to Youssef Sidhom who carries on the torch at Watani, leading it into a modern-day paper. He thanked Samia Sidhom and Dina Sidhom for taking the paper into the electronic age with Wataninet. And he thanked every one of his staff on al-Mahatta, and the kind patients who took the trouble to “be here with me today”. Finally, Ustaz Victor thanked Pope Tawadros and all the bishops and priests who shared in his joy that day. “Thank you, thank you, thank you all,” he said. The evening closed with a hilarious “Happy Birthday to you” in which everyone joined with gusto, and a gigantic birthday cake. Oh, and of course, memorable photos with Ustaz Victor. What will rational governments do?